Approx 19" long including pendant, pendant 3 1/2" x 2 1/2"
This unique sweet necklace is made with a mammoth ivory mother and baby rabbit netsuke and the beautiful stone, kyanite. The netsuke is signed on the underside of the rabbits by the artist that carved it. 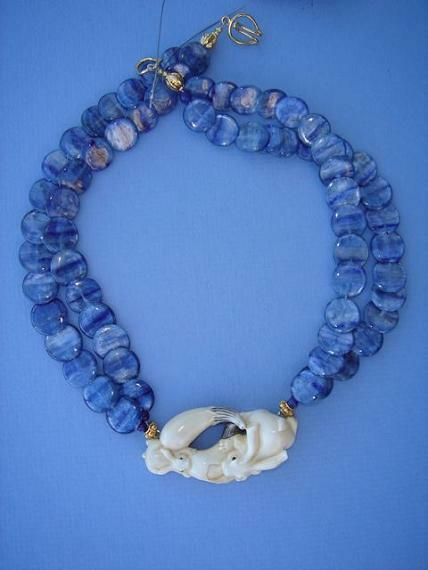 The iridescent kyanite beads are in the shape of a coin and are overlapping. Kyanite is a iridescent stone with near sapphire-like blue color and a pearly luster with a silvery sheen. In ancient times it was believed that a kyanite suspended from a human hair could fallow the Earth's magnetic force like a compass needle. In those times travelers took kyanite along with them, when they entered unknown territories.